The EA trades according to the specified trend. It only opens trades in the direction of the trend and changes direction once that trend changes. It has recovery function to offset any of the trades that goes into negative, seeking to close all in some profit or breakeven or minimal loss. 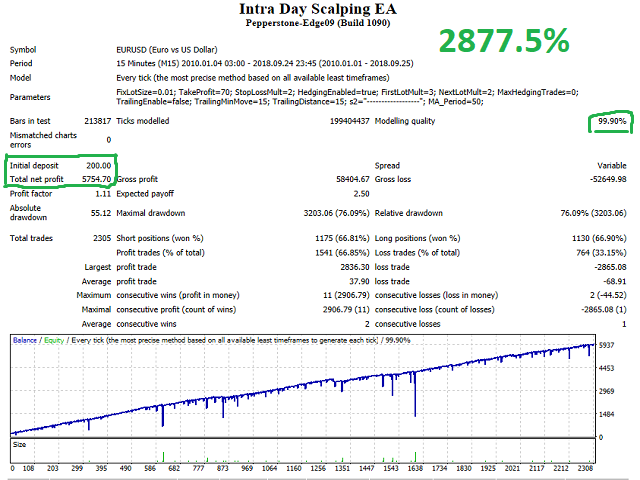 Settings can fully be customized, whether for scalping or intraday purposes. DEFAULT SETTINGS OPTIMIZED FOR EURUSD, EURJPY and EURGBP. When testing, make sure the spread is not abnormal. The EA is versatile and does not require huge investments to start trading. Note however, that very small capital/investment may increase drawdowns. This way, my risks are spread and my chances are maximized. The EA has recovery function that you can deploy. It will seek to recover losing position by closing in profit, breakeven, or little loss (according to your settings). You can fully control the recovery function. 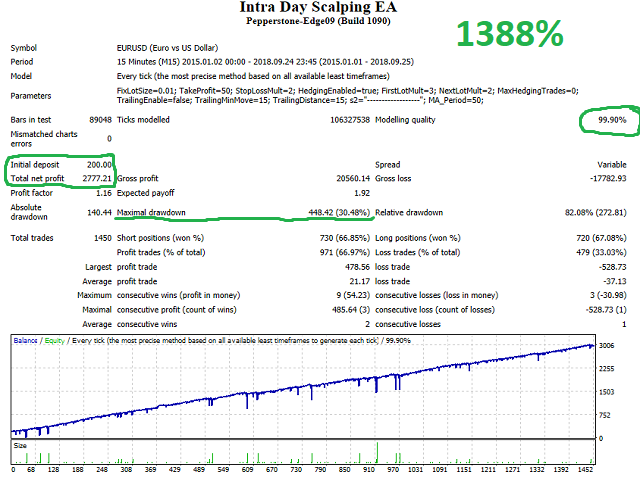 You can use hedging and control the multiplier function according to your taste. You can also specify the number of recovery attempts through the maximum number of hedges allowed. Lot size:	Specify initial lot size. If you will not use the hedging function, this will be your fixed lot size. Stop Loss Multiplier:	This is a multiplier of the Take Profit. Example: If you set to 2, stop loss will be 40 pips when take profit is 20 pips. If you set it to 0.5, stop loss will be 10 when take profit is 20. Enable Hedging:	This is the beginning of the recovery function. Set to TRUE if you want to use the recovery function. 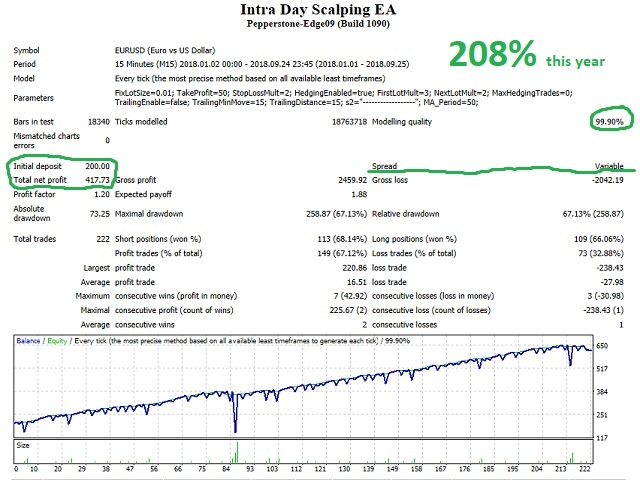 Lot Multiplier for First Hedging:	This will multiply the first hedged trade by the number you specify in order to close all in profit or breakeven eventually. Lot Multiplier for Next Hedgings:	This function activates when the first recovery attempt fails. Depending on the values you use, trades will close in some profit or breakeven. Maximum Number of Hedgings:	In rare scenarios, if you do not want one bad trade to keep hedging and eating up your margin, you can set the limit to the number of hedgings. Enable Trailing Stop:	Set to TRUE if you want to use Trailing Stops. MA	Moving Average. This is the trend filter that guides the EA to trade in the direction of the trend. If price breaks and closes above or below the MA, the EA follows the direction. NB: the EA trades by market orders. Stop loss and take profit levels are all hidden from the chart.